Pac-12 after dark is taking on a whole new meaning after this week as the conference has found itself right in the middle of another officiating scandal entirely of its own making (and not due to the incompetence of referees on the field). The genesis of the scandal came last month when Washington State played USC at the Coliseum. The Trojans escaped with a win on a blocked last second field goal attempt by the Cougars but the far bigger story to emerge from the contest was the uproar over two potential targeting calls in the second half. 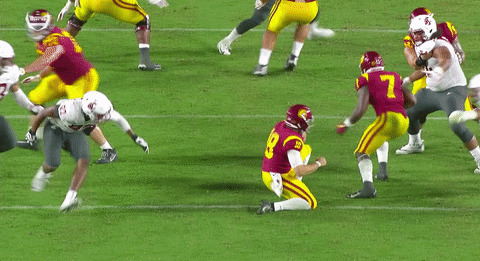 One came in the fourth quarter as USC linebacker Porter Gustin nailed quarterback Gardner Minshew with a helmet-to-helmet hit that was not called for targeting (see below). It seems that during the review process for targeting, according to Yahoo! Sports, Pac-12 general counsel and senior vice president of business affairs Woodie Dixon overruled the officials at the stadium and in the conference command center to claim that the call in question was not targeting — against the wishes of those whose job it is to, you know, actually officiate these things. It was documented as such in an internal report obtained by Yahoo! Sports. “Our conference and our leadership has a deep commitment to the integrity of officiating and to protecting student-athlete health and well being,” Scott said Thursday, addressing the report during Pac-12 basketball media day. “What’s been reported was of significant concern to me. It’s new information to me that I was not aware of. There’s some things that have come out that I’ve had a chance to look into and have had discussions with the individuals involved directly. The Pac-12 will now launch a more through review of how replay works in the conference and will immediately be changing procedures, starting with Friday’s games, and remove administrators from the replay review process entirely. While it goes without saying that every fan believes that their conference officials are some of the worst around, the Pac-12’s issues have been generating headlines for well over a decade. This episode though, goes well beyond a blown call. It’s a full on intervention on behalf of the conference office on an officiating decision. This is the kind of stuff fans and coaches have rumored happens all the time and is now documented publicly as something the Pac-12 has done, all but confirming a widely held conspiracy. It also calls not only the decisions made in the Washington State-USC game into question, but also those of any controversial call of the past several years and especially since the conference command center was put in place last season. Whatever shred of credibility the Pac-12 had when it came to officiating is not only gone, but it will take significant changes to get even a shred back. This is an absolute nightmare scenario for the league and rebooting the entire system (to say nothing of a potential resignation or two) seems like the bare minimum that needs to occur over the coming weeks and months. Dixon will no longer be involved in the replay process and the conference office will be exploring additional changes to the entire officiating process going forward. But make no mistake, this yet another huge black mark on Scott and the Pac-12 itself. There’s already a growing basketball scandal that is sweeping up nearly half of the conference’s schools and this is yet another thing on the commissioner’s plate that he will have to deal with directly as fans remain up in arms and skeptical about the entire administration of the league. Calls for Scott to resign as part of a wholesale house cleaning will grow by the day and you can certainly bet that the forthcoming investigation and resulting changes won’t do much to change the minds of many on the West Coast after a league’s worst fears were revealed for all to see this week.